Building on a commitment to enhance Customer Service in all aspects of the district as part of its five-year Strategic Plan, Detroit Public Schools has launched a new Customer Service System Guarantee to help parents, students, staff, alumni and the community find quick resolution to questions and concerns. The process will work in conjunction with the District’s new Ombudsperson Carol Banks. Banks is a lifelong Detroiter, DPS graduate and former elected member of the Detroit Public School Board. 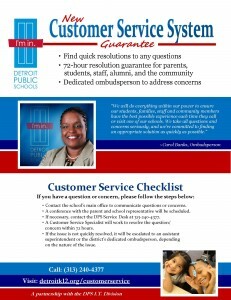 Dubbed the “Customer Service System Guarantee,” the process includes a 72-hour Resolution Guarantee when parents call the DPS Service Desk; and a new website – detroitk12.org/customerservice. The enhanced Customer Service System will assist parents and other DPS customers in getting quick resolution for questions or concerns on Enrollment, Specialized Services (Special Education), Transportation, Pre-Kindergarten and more. If a question or concern is not addressed at the school level, parents and others can call the DPS Service Desk at (313) 240-4377 to start the concern resolution process. A Customer Service Specialist will analyze and triage each issue and/or concern, maintain confidentiality of student information and, in some cases, the concern will be escalated to a principal, an assistant superintendent and/or the Ombudsperson. The Customer Service System Guarantee is part of DPS’ renewed emphasis on Customer Service. The district in August launched its new Customer Service initiative by training all school-based clerical and administrative assistant staff members in two-hour sessions during a day-long Professional Development program. The new initiative is expected to expand throughout the district and will include all Detroit Public Schools staff in all job classifications at schools and Central Office. Detroit Public Schools’ Strategic Plan to create Neighborhood-Centered Quality Schools centers on serving the needs of the students and families by providing more Pre-Kindergarten, new Community Schools serving as hubs of their neighborhoods, more Arts and Music classes, a new Parent University, Career Academies, Better Customer Service, and Improved Safety on Routes to School.